You are at the end of wits. You can feel the blood pressure rising and you shut down the system. It is a long time since you have sat to create a content that will convince your readers to take actions or agree with your point of view. You may be wondering how others are gaining comments and subscribers every day. What might be their secret to success? You know that content is the king, but what you do not know is that context is the kingdom of content. And the ruler of the context is persuasive words. Persuasion through content is more like an exercise that helps to create a win-win situation. You need to present customers with an offer, which they cannot refuse. There are techniques to make your job easy and compelling. And, if you want to master the art of writing convincing content, start with the basics. 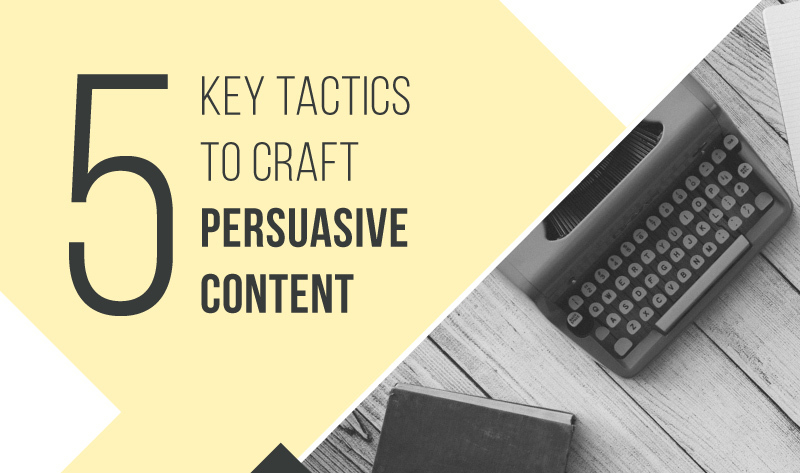 Let us show how these five persuasion strategies are going to help you create a convincing content. Repetition is one of the crucial strategies to deliver convincing contents. Since a person is not going to agree with you if they fail to get what you are saying. There are two types of repetition – good and bad. In order to be on the good side, you need to represent your point in several ways. For example, you may use a story to sound convincing or quote from a famous person. In the example below, the word ‘water-resistant’ has been used a number of times. It is in the headline, and in the bullet points to make the page persuasive. The Unemployed Philosopher’s Guild wants their customers to believe that this watch is water-resistant. And they do it successfully through careful use of repetition. Storytelling mode is one of the catchy techniques. Numerous studies have shown that stories are not only effective in sharing a memorable message, but they are emotionally persuasive. When we hear a story, not only the language sensors of the brain activates but also the other parts. It seems as if we are living in the story. Mentally, we find ourselves in the place of the protagonist. Stories allow people to persuade what the thing is all about. You might say that you never tried to convince anyone. Rather you helped other to take independent decisions. In the example below, we find that Bonobos who are one of the popular men’s clothing line in America have successfully used the art of storytelling. They found a common problem that the chinos, which they bought, did not fit them. And this was the reason the founders sat together to fix the issues and made Bonobos. That is really a convincing story for customers who are looking for comfortable and great chinos. Here's an infographic that sheds some more light on how to leverage storytelling more effectively. If you want to sound convincing to your audience, you need to become an expert in your niche. You do not require a relevant degree or years of experience, but you need to sound convincing to your listeners. Your content must be oozing with confidence and certainty. Experts are people to whom customers lend their ears for specific reasons. Since experts know what are they talking about. They are transparent and do not use filler materials in their contents. They never try to dissuade their customers with gimmicks. If you want to churn your customers through persuasive writing, you have to become an expert in the niche you belong. A typical example in this stance is La Carmina who is a successful travel blogger. She self-describes her approach as “spooky-cute”. She never tries to be all things related to all travelers. She shares the advice on the topic in which she is best at – youth subcultures, alternative beauty especially Goth and Japanese. Consistency is something hard to avoid. The devil deep resides in our mind. We never want to appear inconsistent before our audience. Since the trait associated with inconsistency is that of instability and flightiness, which has a negative impact on readers. While consistency is associated with integrity and rationalism, which every audience loves. So, it is important to be consistent while you are writing a content copy. Since it is hard to get the reader to agree with something up front, which most people had a hard time disagreeing. You have to make your case sound convincing with numbers of evidence. This theme works if you are writing a persuasive content. In the beginning, you need to recognize the problem your audience might be facing. Now you need to qualify your audience. Then agitate the pain points of your audience before you apply the balm. This tingling situation is easy to address with a proper solution, but you need to be a little crafty. You must not be sadistic in the agitation phase. Rather you must present yourself as an empathetic person. You want the audience to know that you understand their problem because you have dealt a problem of similar kind or experienced at eliminating it. The credibility of your solution becomes valuable if you show that you feel the prospect pain truly. Persuasive writing is a process to market your products and services to the subconscious. This is the phase where the purchase decisions are made. In this list of persuasive techniques, you have come across consistent methods that are going to prognosticate the claims you make through writings. You do not need to tackle or employ all the technique at a time. Pick one technique and you will surely improve your conversion rates. Brandon Leibowitz is the founder of Get Plus Followers, a social media marketing agency in Los Angeles, California and Shralpin.com skateboarding news blog. He is featured on sites such as Social Media Today, Live Chat Blog, Simply Measured, Business2Community and other popular sites. You can follow Get Plus Followers on Twitter and Facebook.